I hear there’s this bunch of football (soccer) games going on halfway around the world. When I say hear, I mean, hear. Literally, there are people in my neighborhood of have been watching it live and I can hear it in my house. Fini is a Spanish confectionery company who makes mostly sugar candies like gummis, jellies and novelty gumballs. These World Cup themed gumballs are shaped like a football and feature a flavored liquid filling. They’re just called Bubble Gum Football - Liquid Filled. The package has just four pieces in it, but each is a good mouthful for chewing, not quite enough for adequate bubble blowing (which is probably preferable to vuvuzela blowing even if it means people will step in gum, they’ll still have their hearing). Each piece is .75 inches in diameter. I’m accustomed to soccer balls that are black and white with a hexagonal pattern. These are white (well, pink) with a red (well, darker pink) concentric circle pattern. The flavor, I believe, is strawberry. The gum part has a light sugar coating, but it’s only barely crunchy. The grainy sugar of the gum itself is overshadowed by the tangy berry goo in the center. It’s a nice combination and the chew is soft and pliable for quite a while. When all that fades the bubble blowing can begin, but by then I’ve lost interest and have to toss that piece in favor of a new one. Since Wimbledon is around the corner I thought I’d include another more convincing faux sports ball gum that I got. 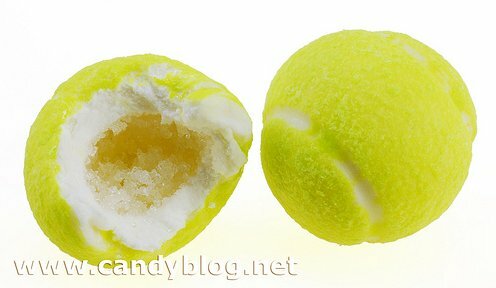 This was a little Tennis Ball Bubble Gum. The gumball is the one on the left, the one on the right is an actual tennis ball. Even though it doesn’t have a coating of fluffy fuzz, the surface at first glance has that texture and a dead on match for the color. The Fini website shows that these are sold in tubs that look like something a Tennis Club would buy to feed the ball machine. I’m sure they’re also in bulk and seen in vending machines for a quarter. Because the piece is so large at 1.25 inches in diameter, I couldn’t just pop it in my mouth and chew. It was more of a bite/gnaw in half and then chew item. The innards are not a goo (though that’s what their website shows), it’s a little pile of sour crystals. At first when I opened it, it was like a little confectionery geode. The flavor is a mild lemon-lime, almost like a Mountain Dew but sometimes I thought it had a green apple note. The chew was fresh and soft, and it got even softer as I chewed it before the sugar dissipated and it became stiffer. The bubble blowing capabilities were okay, not the best I’ve ever had in a gumball, but passable. The flavor didn’t stick around very long, but my style of gum chewing is to discard it after the sugar is gone anyway. These are adequate as gum, but probably more attractive as a novelty item. For less than a dollar I’d probably pick up the World Cup themed ones, just because they did seem like descent quality and a little special for the event. The tennis ones are just amazing to look at, and for decorative purposes alone they will get many customers. Perfect for the tennis fan or tennis player. Quantity: Approximately 72 pieces per pound.